It can be hard to find the right venue for an event. It can be even harder to find one that reflects the personality of you or your brand if you err on the sustainable / ethical / community-minded side of things. We've done the hard work for you scouting and testing out venues and below you'll find a list of the best, all with great minds and the best intentions behind them. Alaska Projects - Established in 2011, Alaska is situated in two disused spaces in a Kings Cross car park. It is the home of rotating art exhibitions, dance and film; and has hosted the fantastic Idea Bombing Sydney. 107 Projects - An old car garage located in 107 Redfern St. transformed into the place for emerging creative artists. Art is expressed without judgment at 107 Projects where exhibitions range from music performances to spoken poetry. Hub Sydney - A co-working space in the busy William Street in Darlinghurst, Hub Sydney offers a complete range of facilities ranging from ping pong tables to a fully equipped kitchen. Keep an eye out for Hub Hyde Park opening in February 2018. Paramount House - A restoration of the former Paramount Pictures building constructed in 1940, Paramount House is a combination of various spaces: cafe, bike shop, cinema, bar and offices. A variety of spaces, ranging from the cafe, an atrium and a cinema, are available for hire. The Basement - Named ‘The Soul of Sydney’, the Basement at Circular Quay is the oldest licensed music venue in Sydney which opened in 1972. It offers amazing gigs but with neat new touches like a Mexican cantina. Wildwon held the Bright Sparks PhD Pitch Night here earlier in 2013 and it was a fantastic, lively venue. Venue 505 - Established in 2004, 505 was developed as a space for local musicians and artists to showcase their music and performances. Run by artists, 505 focuses on supporting its community’s local talent. Red Rattler - Born in 2009, ‘The Rat’ as a not-for-profit warehouse run by artists for artists. It operates on a team of volunteers and works as a creative platform for a wide range of artists, from performers to activists and filmmakers. LeadBelly - A stylish and elegant bar and restaurant, the LeadBelly is located in Newtown and offers a wide variety of music performances. The two-level venue can host over 150 people and various event formats. Foundry616 - Founded by Peter Rechniewski, a jazz fan and co-founder of the Sydney Improvised Music Association (SIMA), Foundry, located in Ultimo, is the best venue for a jazz performance. Young Henry's Brewery - Richard Adamson and Oscar McMahon wanted beer to be more adventurous and fun. In 2012, they started brewing beer in an industrial warehouse in Newton and Young Henry’s was born. Visit the space and get your brew straight from the source. The Lord Nelson - Established in 1842 and located in The Rocks, Lord Nelson is home to some of Sydney's best tasting beer, including the famous Three Sheets Pale Ale. The Royal Albert - Part of Surry Hill’s history, The Royal Albert was established in 1927. An icon to the area’s history, it offers a wide variety of crafted beer and food. The Old Growler - Local, seasonal, sustainable food and drink in a cosy basement in Woolloomooloo. The Local Taphouse - Born out of an idea to have a european-inspired tavern specialising in craft beer, the first Local Taphouse opened in Melbourne in 2008. They offer an extensive beer list with over 300 varieties featuring loads of Aussie craft beers. The Sydney suburbs of Petersham and Clovelly both have beautiful, independently-owned and locally managed lawn bowls clubs that make for a fun and sunny day out. Bowling greens are usually accompanied by a cheap and cheerful club for food and drinks. Depending on club rules, you might even be able to bring your own esky. The Grasshopper - Situated in Sydney’s CBD, the Grasshopper is a local and unique eating house with a focus on respecting the environment: from sourcing organic and local foods to using second hand furniture. Voted Best Small Bar of the Year, it’s a must in the city’s centre. Freda's - Hidden down a laneway off Regent St, Freda’s is not only a bar but also a creative space ‘committed to showcase emerging artists, musicians and DJs”. Love, Tilly Devine - A small wine bar in Darlinghurst, Love Tilly Devine offers over 300 varieties of wine from different parts of the world, carefully selected to create a different wine experience. Rooftop - A space to relax and connect with like-minded people in the community. Located in Marrickville, the Rooftop - with its aquaponic ponds and an amazing food garden - is a different experience. The Calyx - Recently opened in June 2016 in the heart of the Royal Botanic Garden. An integrated mix of indoor and outdoor areas, the Calyx has the advantage of reinventing itself through the various themes of its exhibitions. Definitely a must see. The Royal Hotel Paddington - Includes the Royal Bar, the Verandah and the Elephant Bar, and Rooftop Catering for a variety of events. Prince Alfred Park - After multiple makeovers this park is turning into a sustainable city oasis and has stunning city views. Sections of the park are available to hire via City of Sydney. Hotel Palisades - With its industrial style, you’ll find Public House in the hotel’s ground level. The Light Brigade - Includes a lounge, rooftop, bar and dining. With its 1920’s art deco style, the Brigade is over 120 years old and an icon in the Woollahra Paddington area. Paddington Reservoir - An award winning park, the Reservoir went through various transformations until it opened in its current form in 2009. Griffin Theatre - If you're looking for something slightly more corporate or up market, but still interesting and unique, book in for a show and cocktail / canape function at Griffin. Their food is divine and a recent event we attended hosted by boutique law firm Marque was a perfect combination of stimulating theatre and lively discussion afterwards. Golden Age Cinema & Bar - Located in Paramount House, it’s an absolutely gorgeous-looking cosy cinema space for 50. This venue is ideal for screenings and even talks and lectures. Govinda's & Movie Room - Get comfy on the beanbags, tuck into some delicious vegetarian food and enjoy. Movies scheduled but also available for private hire. Darlinghurst Theatre Company - Is home to the Eternity Playhouse where we hosted our first Purpose event. Available for hire, the playhouse is a 130-year old site which has been carefully renovated. If you enjoy a challenge or you're after a pared back event these venues have minimal infrastructure meaning they're cheap and cheerful so long as you're happy to DIY catering and other event essentials. If you're after a polished event be prepared to bump in nearly everything yourself, but for workshops, exhibitions and launches these venue styles can be fab. The Drill Hall - Located in Rushcutters Bay, the studio can be hired for creative use including dance, drama, art events, workshops, meetings and film shoots. District 01 - Fabulous big space available for hire in the heart of Surry Hills. Commune - In Waterloo, this space offers co-working spaces, photography studios, workshops and event spaces. 303 Cleveland - Offers two spaces: the front bar and the band room. They are famous for their ‘Film NIghts’ and for exhibiting emerging artists. Studio Neon - In Alexandria, Studio Neon is made up of a multi disciplinary team that cover all aspects of your event, from planning to catering. Studio 206 - A massive 50-80 square metres of space in Surry Hills to create your own experience. 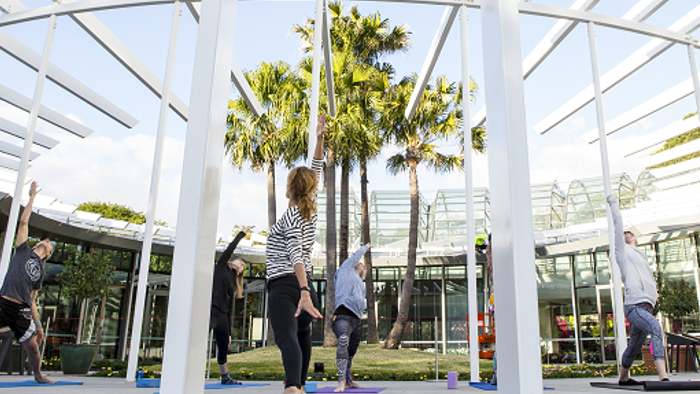 Australian Technology Park - Covering a stunning location in Eveleigh, the ATP provides a wide selection of public open spaces to be enjoyed by the community (and are available for hire). Carriageworks - Is the largest contemporary multi-arts centre in Sydney. It offers more than 10 incredible spaces for hire. For more information and advice on the capacity, catering, pros and cons of these venues it’s best to get in touch with the venues directly. If you'd like help with your next event contact us here at Wildwon.